Peruvian Macgyver ID# 181450 is a stunning maroon colored herd sire of the Accoyo Bruxo line. 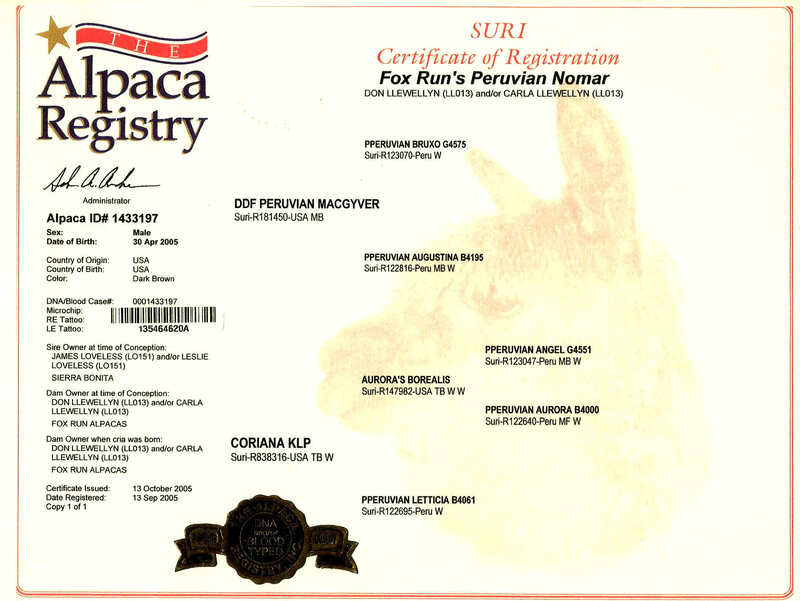 This full Peruvian Suri has produced more Champion alpacas than any other alpaca herd sire in the world. He is truly amazing!!!! At the 2003 AAA Futurity Macgyver ‘s offspring placed in 20 classes making him the 2003 “ Herd Sire of The Year”. In 2004 his offspring placed in even more classes than the previous year. He again became the” Herd Sire Of The Year” for the 2nd time. In 2005 he did it again and made history. 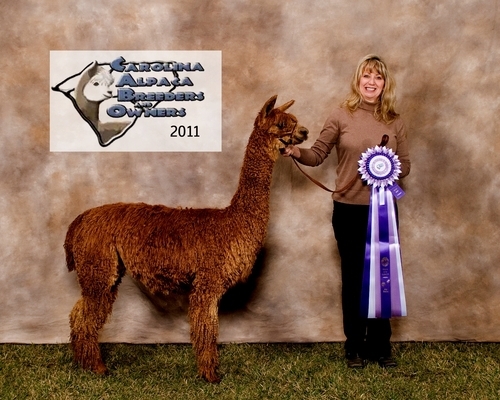 No other alpaca male has ever won “Herd Sire Of The Year” 3 times . In 2006, guess what? Again Macgyver was the clear winner making him “Herd Sire Of The Year” 4 times. In 2007,2008 and 2009 we are in awe! For the 5th,6th and 7th time, Macgyver, won “Herd Sire Of The Year”. He has 100% Suri offspring and has never produced a Huacaya. Coriana was a Full Peruvian, dense, lustrous, true black, stunning female with a spectacular show record to match. This outstanding daughter of Aurora's Borealis, and granddaughter of Pperuvian Angel represented some of the best color genetics in the country. Her untimely death in the summer of 05 was a heartbreak for our ranch. She leaves one amazing offspring; Fox Run's Peruvian Nomar. 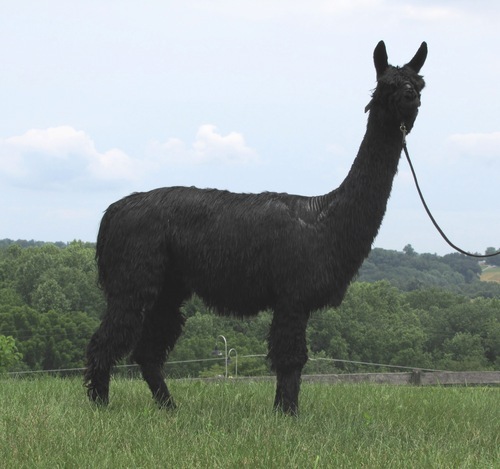 Nomar is a Full Peruvian, Macgyver son out of a sensational Reserve Champion true black Angel granddaughter. 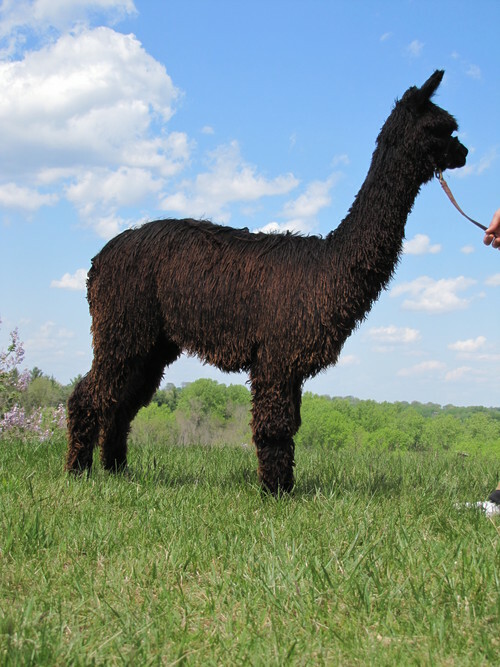 The combination of genetics from the Angel line and the MacGyver line have produced a stunning male with beautiful, solid conformation, deep rich color, and elite fleece characteristics. Nomar had a rough start in life, with his dam being killed by the outside farm herd sire when he was only 3 weeks old, The stress of being orphaned and transported a great distance caused him to have massive fiber breaks. By the time the fiber had grown enough for showing, he was over 2 years old, so he was not shown. However, his fiber is exquisite and has won many awards. Nomar has very correct conformation and proportions and it is a shame that he missed the key shows those 2 years. Nomar displays strong bone and overall substance, a perfect typey head, fabulous coverage from his black nose to his black toes, and outstanding consistent individual locks over his entire body. 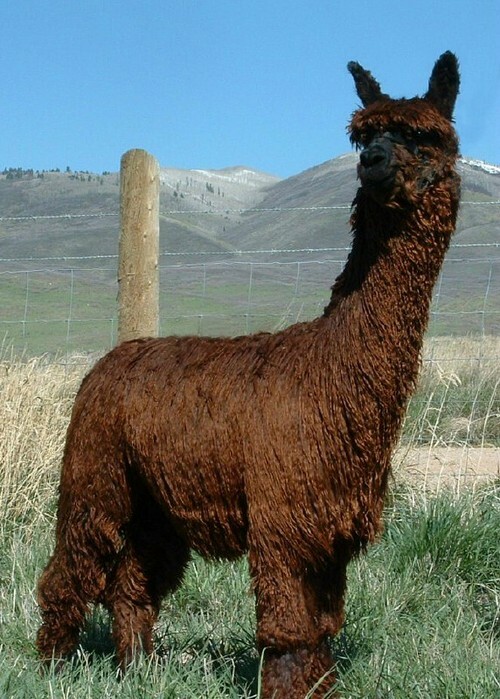 He is dark brown with a gorgeous, high luster, mahogany cast to his fleece. His temperament is confident and trusting. He is a delightful animal to be around! He is a determined yet gentle breeding male often settling females in one calm 15 minute breeding. Nomar has produced over 25 crias. 100% have color including true blacks out of both non whites and whites, striking multis, and numerous browns! He is consistently producing crias with deep rich color, beautiful bearded heads, solid bone, excellent conformation and dense, high luster locked fleece. Great males have the ability to consistently pass on excellent traits. Nomar is making his mark by consistently stamping beautiful fleece characteristics and wonderful conformation and temperament on his offspring! Nomar is available for mobile breedings and resident breedings here at the farm. 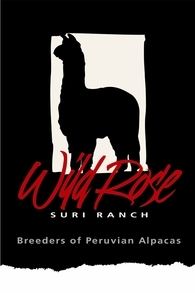 Live cria birth guarantees, 45 days board for the dam (crias extra @$3.00 per day), and ultrasound confirmation included for resident breeding. Mobile breedings can also be done at our farm where you bring the female to Wild Rose Suri Ranch for breeding and receive a $250 discount off the breeding fee. Take advantage of these outstanding genetics and call Patti at 443-740-4240 to book breedings today. Great breeding discounts are available for both drive by breedings and multiple female bookings.